It’s amazing how much of my day revolves around tea. Even on the weekend, I’m immersed in tea. It’s just part of my life. This weekend I’m brewing homemade kombucha. I’ve been making it since 1994 when I first learned how. My secret is placing the fermenting tea close to my indoor plants. It’s sweeter that way. I actually found this out by accident, though. When I started brewing, the only place I had to put the gallon container was on the plant-covered table in my kitchen, close to the back window. The plants got the sun while the kombucha got the warmth. Sweet kombucha was the result. My grandmother was also brewing kombucha at the time, but for some reason it always tasted like vinegar. She kept it on a high shelf in her laundry room where it was dark and away from other growing things. I don’t think her kombucha mushroom liked it very much. Either that, or she fermented it for way too long. Unfortunately I wasn’t able to get a mushroom from anyone this time so I went with my second choice: growing my own mushroom from bottled kombucha. 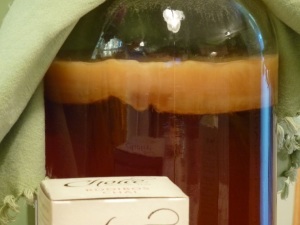 I look for ready-to-drink kombucha with quite a bit of sediment in the bottom of the bottle. Following my regular recipe, I just use the bottled kombucha as the starter and make sure the sediment joins the mixture before setting it on the shelf to ferment. When starting a batch this way, it has to ferment for much longer in order to form the mushroom. What you’re looking at here is three or four weeks of fermenting from sediment to achieve what’s known as the “mother”. I’ll use this mother and some of the kombucha to make my next batch. And guess what flavor I’m going for? With all the talk of warming up as the days get cooler, of course I’m choosing chai! And not just chai, but green tea, rooibos chai. That should fend off the flu and winter colds, keep me warm and help me sleep, huh? 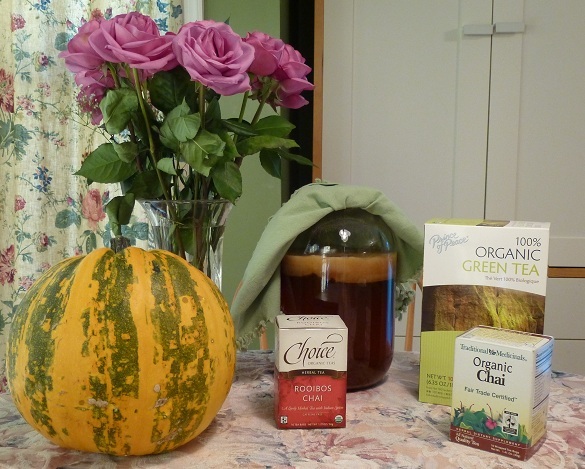 Have an idea for an unusual combination for my next batch of kombucha? Let me know! I never realized just how much tea and tea paraphernalia I had acquired until I started working at The Daily Tea. Now I celebrate a passion I didn't realize I had. Loose, unsmoked yerba mate, brewed in a French press, starts my day. And I've been brewing my own kombucha since 1994! What tea treasures will I discover next?